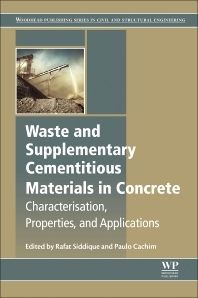 Waste and Supplementary Cementitious Materials in Concrete: Characterisation, Properties and Applications provides a state-of-the-art review of the effective and efficient use of these materials in construction. Chapters focus on a specific type of material, addressing their characterization, strength, durability and structural applications. Sections include discussions of the properties of materials, including their physical, chemical and characterization, their strength and durability, modern engineering applications, case studies, the state of codes and standards of implementation, cost considerations, and the role of materials in green and sustainable construction. The book concludes with a discussion of research needs. Paulo Cachim is an Associate Professor with Habilitation at Civil Engineering Department of the University of Aveiro, Portugal. He received his doctorate in 2000 from the University of Porto, Portugal. He is the author of over 40 research articles in peer-reviewed journals and has published three books on timber and concrete. His research interests include, besides the use of recycled and waste materials in concrete, both as aggregate or supplementary cementitious materials, the development of multifunctional concrete with carbon for infrastructure monitoring and software development for structural analysis. He has also been a visiting/invited Professor to number of Universities in Brazil, Belgium, Lithuania, Montenegro, Romania, Slovakia, and Poland.